For other battles with similar names, see Battle of Abukir (disambiguation). 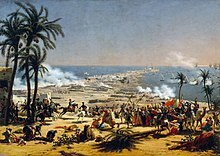 The Battle of Abukir (or Aboukir or Abu Qir) was a battle in which Napoleon Bonaparte defeated Seid Mustafa Pasha's Ottoman army on July 25, 1799, during the French campaign in Egypt. It is considered the first pitched battle with this name, as there already was a naval battle on August 1, 1798 (a second pitched battle followed on March 8, 1801). No sooner had the French forces returned from a campaign to Syria, than the Ottoman forces were transported to Egypt by Sidney Smith's British fleet to put an end to French rule in Egypt. Seid Mustafa Pasha was an experienced commander who had fought against the Russians. He knew that cavalry charges against the French squares were futile. So, he sought to avoid them by fortifying his beachhead with two defensive lines. From this beachhead Mustafa could carry out the invasion of Egypt. However, Napoleon immediately saw the flaw in the tactic as it meant that the Turks had nowhere to run if routed. The French attacked the Ottoman positions and quickly broke through the first defensive line before it was fully completed. The second line, however, proved tougher to defeat and the French withdrew for a while. At this point, cavalry general Murat saw his opportunity and attacked with his cavalry, quickly routing the exposed Turks. Murat's charge was so rapid that he burst inside Mustafa's tent and captured the Turkish commander, severing two of the Turk's fingers with his sabre. In return, Mustafa shot Murat in the jaw. Immediately, Murat was operated on and resumed his duties the next day. The Turkish army fled in panic. Some Ottomans drowned trying to swim to the British ships two miles away from shore, while others fled to Abukir castle, but they surrendered shortly thereafter. The Turks suffered about 8,000 casualties and the French only 1,000. News of the victory reached France before Napoleon arrived in October and this made him even more popular, an important asset considering the troubles brewing in the French Directory. This battle temporarily secured France's control over Egypt. The Ottoman army led by Britain declared war on France. Two armies were to attack Egypt: one carried by the British fleet, the other concentrated in north Syria. As usual, Bonaparte chose to take the initiative: in February 1799 he conquered Gaza, El Arish and Jaffa but failed before the town of Saint-Jean-d'Acre after two months of siege. This city was defended by its governor, Djezzar Pasha and his former fellow student of the Ecole Militaire in Paris, Antoine de Phélippeaux, an excellent gunner. In addition, the city was continually replenished with men, food, water and other necessities by the British Navy. The French army being decimated by the plague, Napoleon ended his dreams of conquest in the East. He dreamed of taking Constantinople and then invading India to help the local insurgency against the British. He also dreamed that once in Constantinople, he could return with his army to France through Vienna. On July 14, 1799, a British fleet of 60 ships landed with 16,000 men under the command of Mustapha Pasha, a veteran of the last Russo-Turkish war. They stormed the fortifications of the harbor and put 300 French troops under the command of Battalion Chief Godart, hors de combat. The peninsula changed hands and Turkish flags fluttered on the bastions of the city. Proud of this success, Mustapha Pasha was in no hurry to march on Cairo. Murad Bey, who managed to escape and join him, said, "The French dreaded that you could not support the presence, I watch, and they are fleeing before me." and Murad replied, "Pasha, be glad that it suits the French to withdraw, because if they turned, you would disappear before them like dust before the north wind." Napoleon brought together as many troops as possible. Without waiting for Kleber, he approached Abukir with the divisions of Lannes, Desaix and Murat's cavalry, 7,700 men and 1,000 horsemen and the Turks gathered 18,000 men, 8,000 of whom were in a condition to fight. On July 25, the Turks were on the defensive and relied on a strong redoubt between their lines and the sea. The British, too far from shore because of shallow waters, could not use their artillery against the French. Bonaparte established his artillery on the heights, but his first attack was a failure, because Desaix stalled and Murat dared not proceed when he saw the shot flying above his head. Pasha took advantage of the lull, and attacked the fort with his men, decapitating fallen French troops. Rage seized the French, who without orders, rushed into the enemy ranks. Murat wheeled his cavalry driving quickly through the Turkish lines and ended up behind the town, cutting off Mustapha Pasha's retreat. Murat captured Mustapha Pasha in single combat. Meanwhile, some of the Turkish army drowned while trying to swim to Turkish gunboats and the British vessels; while 3,000 Ottomans succeeded in taking refuge in the fort. Lacking the rallying force of their commander, they were forced by thirst and hunger to surrender two days later. Murat was promoted to the General rank of the evening division. The French suffered only 220 dead and 600 wounded while the Turkish losses were enormous: 2,000 dead on the battlefield, 4,000 men drowned, 1,000 dead and 1,500 prisoners captured from the fort of Abukir. Sidney Smith, admiral of the British fleet, blamed the defeat on the Ottoman chiefs, as they had not followed his advice to seize the town of Rosetta in order to isolate Alexandria. Furthermore, the Ottomans did not engage all their troops from the objective for the capture of Alexandria. Abukir gave the French a few months respite. Desaix continued through Upper Egypt in search of Murad Bey. On August 23, leaving the command to Kleber, Bonaparte embarked on the frigate Muiron, with Berthier, Murat, Lannes and others, because, from reading the British newspapers, he had learned of the recent defeats of the Directory. On this occasion, he earned the nickname "General Good Catch". In the long term, a French presence in Egypt was impossible to maintain. Kleber did restore French rule over the country thanks to his victory at Heliopolis on March 18, 1800, but less than a month later he was murdered in his garden in Cairo by a student of theology. Kleber's successor, Menou, lacking the skills of a war leader, was defeated at Canopus and surrendered on September 2. Under the convention signed with the British, the French army came back to France in British ships. Egypt remained in French memory as an incredible adventure, and two or three hundred Mamluk stragglers or deserters became "French Mamluks." Thus, Chateaubriand could meet Gascons or Picards, renowned for their courage and whose beys and pashas quarreled services. Connelly, Owen (2006). Blundering to Glory: Napoleon's Military Campaigns (third ed.). Lanham, Maryland: Rowman & Littlefield. ISBN 978-0-7425-5317-0. Durant, Will; Durant, Ariel (1975). The Age of Napoleon: A History of European Civilization from 1789 to 1815. Volume XI of The Story of Civilization. New York: Simon and Schuster. ISBN 978-0-671-21988-8. Henty, George Alfred (1899). At Aboukir and Acre: A Story of Napoleon's Invasion of Egypt. London: Blackie & Son. McLynn, Frank (2002). Napoleon: A biography. New York: Arcade. ISBN 978-1-55970-631-5. Pawly, Ronald (2012). Napoleon's Mamelukes. Oxford, England: Osprey. ISBN 978-1-78096-419-5. Isenberg, Joseph M. (2002). "Aboukir (25 July 1799)". In Sandler, Stanley (ed.). Ground Warfare: An international encyclopedia. 1, A–G. Santa Barbara, California: ABC-CLIO. pp. 3–4. ISBN 978-1-57607-344-5.